In a press release published by the Venezuelan Foreign Minister, the Bolivarian government “deeply and painfully” lamented the loss of human lives after two people were killed and six members of a humble family died by an intentional fire in the working class “Carlos Marx” neighborhood in Managua, the capital city. El Gobierno de la República Bolivariana de Venezuela condena enérgicamente el uso de la violencia con fines políticos por parte de factores de la oposición nicaragüense, cuyo propósito es hacerse del poder por vías no democráticas. 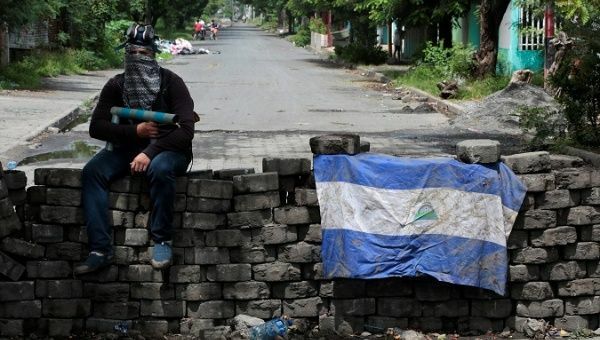 “Being conscious of the social damage caused by these intolerance and hate crimes, [the government of Venezuela] stands in solidarity with the Nicaraguan people and its government, reiterating the only way to guarantee peace and reconciliation is through dialogue and not the disproportionate and irrational use of force,” says the communique. The government of Venezuela called on international bodies and foreign countries to contribute to peace in Nicaragua instead of promoting conflict among the parties. According to a statement by the fire department, neighbors told them that a group of masked vandals threw Molotov cocktails at the house causing the fire. The large house, which was used to store mattresses and other items, caught fire quickly. Meanwhile the government and opposition Saturday started the second day of national dialogue, mediated by the Catholic church. During the talks, detractors of Daniel Ortega’s government tried to place blame for the fire on the government, claiming it was Ortega’s supporters who burned down the house with the family inside. Later, a police report stated that at 8:45 a.m. municipal workers, police and neighbors who were removing roadblocks were attacked by masked criminals, who shot at them and killed Francisco Arauz and Antonio Fernandez. The report says their bodies were burned using gasoline and tires.